If you have any interest in Tim Gunn, this is a great interview! For someone with such a goofy comic persona, Michael Ian Black is an intelligent and perceptive interviewer. This is one of his best. I am eagerly downloading all the other episodes NOW. I need good, smart people in my ears. I've also subscribed to Topics, which he co-hosts with Michael Showalter. "Topics" is a whole different animal. Very funny, but in small doses (for me). Thanks for making me aware of this podcast. Listened to the Bob Odenkirk and Jim Gaffigan episodes. I've mostly grown tired of Marc Maron so this will make a nice substitute. Thank you so much for posting this. 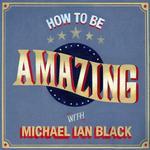 I am a fan of Michael Ian Black, but did not know about this podcast. An hour very well spent! There's also Mike and Tom Eat Snacks, with MIB and Tom Cavanaugh. This was lovely! I really like to hear Tim Gunn and there were some aspects of his life story that I didn't know that came out in this interview. I know he loves his life, but his bad experience with one relationship basically making him shy away from any romantic contact EVER for the rest of his life just makes me a little sad for him.